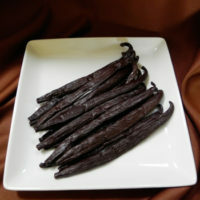 Planifolia (Bourbon) vanilla beans, grown in Papua New Guinea under organic conditions. Non-GMO and gluten-free. Approximately 125 beans per pound. Please note: This item will be shipped via USPS Priority Mail. Click to buy from Vanilla Enchantment. 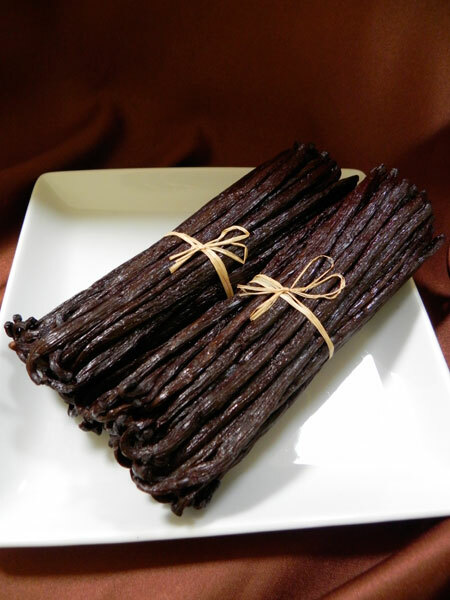 Bourbon Vanilla is a generic term for Vanilla Planifolia, and is the most commonly used variety in vanilla extract.Vanilla Planifolia stock originated in Mexico, vanilla’s birthplace, but cuttings were taken to other tropical countries in the 1700s. In the 1800s, the French developed large plantations on Reunion, known at the time as the Ile de Bourbon, hence the name Bourbon. Bourbon vanilla beans are typically long and slender, with a rich flavor and aroma. They have thick, oily skin, strong vanilla notes and contain an abundance of tiny seeds. Add half a Bourbon bean as you make Beef Bourguignon or even humble beef stew. Wonderful roasted along with pork tenderloin and fruit. Terrific as the flavor for home made ice cream. Feeling extravagant? Use the beans as swizzle sticks in bar drinks at a party. They can be washed, dried and used again — that is, assuming your guests don’t take them home as souvenirs. Excellent for extract making as well. There are approximately 125 beans per pound. Average length of beans is 7 inches (17-18 cm). Hesitant to buy in bulk? Read this: 5 good reasons buying in bulk makes sense.